Tunguska-M1 is a gun/missile system for low-level air defence. Launch of the 9M311 - M1 Surface-to-Air Missile. Tunguska-M1's 30mm guns firing tracer rounds. Tunguska-M1 with hatch open showing the radar. Tunguska-M1 is a gun/missile system for low-level air defence. The system was designed by the KBP Instrument Design Bureau in Tula, Russia and is manufactured by the Ulyanovsk Mechanical Plant, Ulyanovsk, Russia. It can engage targets while stationary and on the move, using missiles for long-range targets and guns for close-in defence. It is designed for defence against both fixed-wing aircraft and helicopters and can also fire on ground targets. Tunguska entered service with the Russian army in 1988 and has been exported to Germany, India, Peru, Morocco and Ukraine. 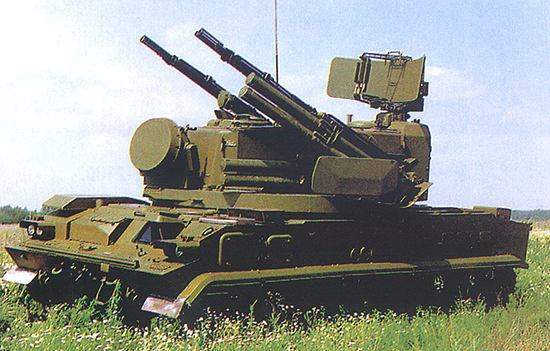 The Tunguska-M1 vehicle carries eight 9M311-M1 surface-to-air missiles. The missile (NATO designation SA-19 Grison) has semi-automatic radar command to line-of-sight guidance, weighs 40kg with a 9kg warhead. It is 2.5m long with a diameter of 1.7m and wingspan of 2.2m. The missile’s maximum speed is 900m/s and can engage targets travelling at speeds up to 500m/s. Range is from 15 to 6,000m for ground targets and 15 to 10,000m for air targets. Two twin-barrel 30mm anti-aircraft guns are mounted on the vehicle. These guns have a maximum firing rate of 5,000 rounds per minute and a range of 3,000m against air targets. This extends to 4,000m against ground targets. The system has target acquisition radar and target tracking radar, optical sight, digital computing system, tilt angle measuring system and navigation equipment. Radar detection range is 18km and tracking range is 16km. The Tunguska-M1 system is mounted on a 34t tracked vehicle with multi-fuel engine. It has hydromechanical transmission, hydropneumatic suspension which allows for changing road clearance and hydraulic track-tensioning. The armoured turret has both laying and stabilisation drives and power supply. Air-conditioning, heating and filtration systems are fitted. A Tunguska-M1 battery is composed of up to six vehicles and will also include a transloader as well as maintenance and training facilities. The armoured turret has both laying and stabilisation drives and power supply. Air-conditioning, heating and filtration systems are fitted. A Tunguska-M1 battery is composed of up to six vehicles and will also include a transloader as well as maintenance and training facilities.